Being able to tap the vast amounts of oil locked within U.S. oil shale could go a long way toward satisfying the nationâ€™s future oil demands. Oil shale is a sedimentary rock containing solid organic material that converts into a type of crude oil when heated. The Green River Formationâ€”an assemblage of over 1,000 feet of sedimentary rocks that lie beneath parts of Colorado, Utah, and Wyomingâ€”contains the worldâ€™s largest deposits of oil shale. The U.S. Geological Survey (USGS) estimates that the Green River Formation contains about 3 trillion barrels of oil, and about half of this may be recoverable, depending on available technology and economic conditions.1 This is an amount about equal to the entire worldâ€™s proven oil reserves. The thickest and richest oil shale within the Green River Formation exists in the Piceance Basin of northwest Colorado and the Uintah Basin of northeast Utah. According to the Government Accountability Office, the Green River Formation covers areas of Colorado, Utah and Wyoming and together has about as much recoverable oil as the entire worldâ€™s proven reserves, combined. The land that the large oil field sits on is mostly vacant and under federal control. The GAO testified before Congress saying that the US government was in â€œa unique position to influence the development of oil shaleâ€� because the Green River deposits were mostly on federally owned land. However, the GAO did warn of possible environmental impact which could pose a problem as this area would swell up with workers in these small towns. The GAO went on to say that local governments could have a hard time adapting to accommodate higher populations. The USGS has estimated that the Green River Formation has about 3 trillion barrels of oil which about half may be recoverable. However, even after only half is recoverable, it is still the largest reserve in the world. This is huge for the US who has been trying to gain energy independence for some time. Originally, people thought the only way to get there was only natural gas. After this find, it appears oil is here to stay a little longer. Not only will our oil costs be lower but this massive oil field will require lots of hard working Americans to man the field and extract the oil, etc. This could potentially solve a couple of big issues that the US has been facing for awhile. However, before we break out the champagne, realize that most of this land is under federal authority which means we need Congress to open up the area to oil drillers to begin extracting the oil. Unfortunately, gridlock government is worst government to have if you want to get things done. My only hope is that the GAO Congressional testimony was enough to wake up Washington to realize that our goals of energy independence and speeding up the economic recovery are within reach. Obviously, this wonâ€™t happen overnight but certainly a reasonable timeframe would be great as Americans continue to pay high prices at the pump, causing strain on the economy as well. The bottom line is that this Green River Formation has a lot of potential but there are some hurdles we have to clear first which could take some time. However, this has a lot of potential for the US and a lot of reward as long as we do this right. Keep an eye on Washington to get an idea on the timeframe of this project. 'Unconventional Oil and Gas Production: Opportunities and Challenges of Oil Shale Development' which was released on May 10, 2012. Every attempt has been made to maintain the structural and data integrity of the original printed product. Accessibility features, such as text descriptions of tables, consecutively numbered footnotes placed at the end of the file, and the text of agency comment letters, are provided but may not exactly duplicate the presentation or format of the printed version. The portable document format (PDF) file is an exact electronic replica of the printed version. We welcome your feedback. Please E-mail your comments regarding the contents or accessibility features of this document to [email protected]. Highlights of GAO-12-740T, a testimony before the Subcommittee on Energy and Environment, Committee on Science, Space, and Technology, House of Representatives. Fossil fuels are important to both the global and U.S. economies, and â€œunconventionalâ€� oil and gas resources-â€”resources that cannot be produced, transported, or refined using traditional techniques-â€”are expected to play a larger role in helping the United States meet future energy needs. With rising energy prices one such resource that has received renewed domestic attention in recent years is oil shale. Oil shale is a sedimentary rock that contains solid organic material that can be converted into an oil-like product when heated. About 72 percent of this oil shale is located within the Green River Formation in Colorado, Utah, and Wyoming and lies beneath federal lands managed by the Department of the Interiorâ€™s Bureau of Land Management, making the federal government a key player in its potential development. In addition, the Department of Energy (DOE), advances energy technology, including for oil shale, through its various offices, national laboratories, and arrangements with universities. GAOâ€™s testimony is based on its October 2010 report on the impacts of oil shale development (GAO-11-35). This testimony summarizes the opportunities and challenges of oil shale development identified in that report and the status of prior GAO recommendations that Interior take actions to better prepare for the possible future impacts of oil shale development. * Increasing domestic oil production. Tapping the vast amounts of oil locked within U.S. oil shale formations could go a long way toward satisfying the nationâ€™s future oil demands. Oil shale deposits in the Green River Formation are estimated to contain up to 3 trillion barrels of oil, half of which may be recoverable, which is about equal to the entire worldâ€™s proven oil reserves. * Socioeconomic benefits. Development of oil shale resources could lead to the creation of jobs, increases in wealth, and increases in tax and royalty payments to federal and state governments for oil produced on their lands. The extent of these benefits, however, is unknown at this time because the ultimate size of the industry is uncertain. * Impacts on water, air, and wildlife. Developing oil shale and providing power for oil shale operations and other activities will require large amounts of water and could have significant impacts on the quality and quantity of surface and groundwater resources. In addition, construction and mining activities during development can temporarily degrade air quality in local areas. There can also be long-term regional increases in air pollutants from oil shale processing and the generation of additional electricity to power oil shale development operations. Oil shale operations will also require the clearing of large surface areas of topsoil and vegetation which can affect wildlife habitat, and the withdrawal of large quantities of surface water which could also negatively impact aquatic life. * Socioeconomic impacts. Oil shale development can bring an influx of workers, who along with their families can put additional stress on local infrastructure such as roads, housing, municipal water systems, and schools. Development from expansion of extractive industries, such as oil shale or oil and gas, has typically followed a â€œboom and bustâ€� cycle, making planning for growth difficult for local governments. Moreover, traditional rural uses would be displaced by industrial uses and areas that rely on tourism and natural resources would be negatively impacted. I am pleased to be here today to participate in your hearing on the challenges and opportunities related to the potential development of unconventional oil and natural gas resources. As you know, fossil fuels are important to both the global and U.S. economies, and among other things, we rely on oil to fuel our transportation vehicles and on natural gas to a significant extent to heat and power our homes, businesses, and industries. For many years, the United States has relied heavily on imported oil and, to a lesser extent, imported natural gas, with domestic production largely limited to conventional oil and gas resources. However, in recent years, improvements in technology have allowed oil and gas operators to extract oil and natural gas from unconventional resources--resources that cannot be produced, transported, or refined using traditional techniques. Examples of unconventional resources include oil shale (a sedimentary rock containing solid organic material that can be converted into a petroleum-like oil when heated), shale oil and gas, natural gas hydrates (crystalline solids consisting of water, methane, and usually a small amount of other gases that form beneath permafrost and on the ocean floor), and tar sands (a combination of clay, sand, water, and bitumen, a heavy black viscous oil). These unconventional oil and gas resources are expected to play a larger role in helping the United States meet its future energy needs. In recognition of this fact, the Departments of Energy and the Interior and the Environmental Protection Agency released a memorandum on April 13, 2012, announcing a collaborative interagency effort on unconventional oil and gas research. The memorandum states that the agencies will develop a multi-agency program focused on the highest priority challenges associated with safely and prudently developing unconventional resources. My statement today is focused on oil shale development and will highlight several issues related to the opportunities and challenges related to oil shale development that we identified in an October 2010 report undertaken at the request of this committee. [Footnote 1] In addition, I will highlight the key actions that federal agencies can take to proactively prepare for the potential development of a future oil shale industry. Our October 2010 report was one of a series of reports that we have completed that examine the nexus between energy and water resources. [Footnote 2] This 2010 report contains a detailed explanation of the methods used to conduct our work, which we performed in accordance with generally accepted government auditing standards. of the Interior's (Interior) Bureau of Land Management (BLM). The Energy Policy Act of 2005 directed Interior to lease its lands for oil shale research and development. In June 2005, BLM initiated a leasing program for research, development, and demonstration (RD&D) of oil shale recovery technologies. By early 2007, it had granted six small RD&D leases: five in the Piceance Basin of northwest Colorado and one in the Uintah Basin of northeast Utah. The leases are for a 10-year period, and if the technologies are proven commercially viable, the lessees can significantly expand the size of the leases for commercial production into adjacent areas known as preference right lease areas. The Energy Policy Act of 2005 also directed Interior to develop a programmatic environmental impact statement (PEIS) for a commercial oil shale leasing program. During the drafting of the PEIS, however, BLM determined that, without proven commercial technologies, it could not adequately assess the environmental impacts of oil shale development and dropped from consideration the decision to offer additional specific parcels for lease. Instead, the PEIS analyzed making lands available for potential leasing and allowing industry to express interest in lands to be leased. Environmental groups then filed lawsuits, challenging various aspects of the PEIS and the RD&D program. Since then, BLM has initiated another round of oil shale RD&D leasing and the lawsuits were settled. Stakeholders in the future development of oil shale are numerous and include the federal government, state government agencies, the oil shale industry, academic institutions, environmental groups, and private citizens. Among federal agencies, BLM manages federal land and the oil shale beneath it and develops regulations for its development. research, development, and demonstration, is underway. Our October 2010 report found that oil shale development presents significant opportunities for the United States. Potential opportunities associated with oil shale development include increasing domestic oil production and socioeconomic benefits. * Increasing domestic oil production. Being able to tap the vast amounts of oil locked within U.S. oil shale formations could go a long way toward satisfying the nation's future oil demands. The Green River Formation--an assemblage of over 1,000 feet of sedimentary rocks that lie beneath parts of Colorado, Utah, and Wyoming--contains the world's largest deposits of oil shale. USGS estimates that the Green River Formation contains about 3 trillion barrels of oil, and about half of this may be recoverable, depending on available technology and economic conditions. Green River Formation can be recovered. At the midpoint of this estimate, almost half of the 3 trillion barrels of oil would be recoverable. This is an amount about equal to the entire world's proven oil reserves. The thickest and richest oil shale within the Green River Formation exists in the Piceance Basin of northwest Colorado and the Uintah Basin of northeast Utah. Figure 1 shows where these prospective oil shale resources are located in Colorado and Utah. Most geologically prospective oil shale resource. * Socioeconomic benefits. Development of oil shale resources could also yield important socioeconomic benefits, including the creation of jobs, increases in wealth, and increases in tax and royalty payments to federal and state governments for oil produced on their lands. Our October 2010 report did not attempt to quantify these potential socioeconomic benefits because of current uncertainty surrounding the technologies that might be used to develop oil shale resources, which would influence the ultimate size of a future oil shale industry. Our October 2010 report also found, however, that there are a number of key challenges associated with potential oil shale development in the United States, including: (1) uncertainty about viable technologies, (2) environmental impacts that affect water quantity and quality, air, and land, and (3) socioeconomic impacts. * Uncertainty about viable technologies. A significant challenge to the development of oil shale lies in the uncertainty surrounding the viability of current technologies to economically extract oil from oil shale. To extract the oil, the rock needs to be heated to very high temperatures--ranging from about 650 to 1,000 degrees Fahrenheit--in a process known as retorting. Retorting can be accomplished primarily by two methods. One method involves mining the oil shale, bringing it to the surface, and heating it in a vessel known as a retort. Mining oil shale and retorting it has been demonstrated in the United States and is currently done to a limited extent in Estonia, China, and Brazil. However, a commercial mining operation with surface retorts has never been developed in the United States because the oil it produces competes directly with conventional crude oil, which historically has been less expensive to produce. The other method, known as an in-situ process, involves drilling holes into the oil shale, inserting heaters to heat the rock, and then collecting the oil as it is freed from the rock. Some in-situ technologies have been demonstrated on very small scales, but other technologies have yet to be proven, and none has been shown to be economically or environmentally viable at a commercial scale. According to some energy experts, the key to developing our country's oil shale is the development of an in-situ process because most of the richest oil shale is buried beneath hundreds to thousands of feet of rock, making mining difficult or impossible. In addition to these uncertainties, transporting the oil produced from oil shale to refineries may pose challenges because pipelines and major highways are not prolific in the remote areas where the oil shale is located, and the large-scale infrastructure that would be needed to supply power to heat the oil shale is lacking. * Environmental impacts on water, air, and wildlife. Developing oil shale resources poses significant environmental challenges, particularly for water quantity and quality but also for air and wildlife. - Water quantity. Oil shale development could have significant impacts on the quantity of surface and groundwater resources, but the magnitude of these impacts is unknown because of the technological uncertainties, and also because the size of a future oil shale industry is unknown, and knowledge of current water conditions and groundwater flow is limited. Developing oil shale and providing power for oil shale operations and other associated activities will require significant amounts of water, which could pose problems, particularly in the arid West where an expanding population is already placing additional demands on available water resources. For example, some analysts project that large scale oil shale development within Colorado could require more water than is currently supplied to over 1 million residents of the Denver metro area and that water diverted for oil shale operations would restrict agricultural and urban development. The potential demand for water is further complicated by the past decade of drought in the West and projections of a warming climate in the future. Current estimates of the quantities of water needed to support a future oil shale industry vary significantly depending upon the assumptions that are made. However, as our 2010 report noted, while water is likely to be available for the initial development of an oil shale industry, the eventual size of the industry may be limited by the availability of water and demands for water to meet other needs of the region. Oil shale companies operating in Colorado and Utah will need to have water rights to develop oil shale, and representatives from all of the companies with whom we spoke for our 2010 report were confident that they held at least enough water rights for their initial projects and will likely be able to purchase more rights in the future. Sources of water for oil shale will likely be surface water in the immediate area, such as the White River, but groundwater could also be used. However, as we reported in 2010, the possibility of competing municipal and industrial demands for future water, a warming climate, future needs under existing compacts, and additional water needs for the protection of threatened and endangered fishes, may eventually limit the size of a future oil shale industry. - Water quality. While the water quantity impacts from oil shale development are difficult to precisely quantify at this time, hydrologists and engineers have been able to more definitively determine the water quality impacts that are likely because other types of mining, construction, and oil and gas development cause disturbances similar to impacts expected from oil shale development. According to these experts, in the absence of effective mitigation measures, impacts from oil shale development to water resources could result from (1) disturbances to the ground surface during the construction of roads and production facilities, which could result in the degradation of surface water quality from the related runoff of sediment, salts, and possible chemicals to nearby rivers and streams, (2) the withdrawal of water from streams and aquifers for oil shale operations, which could decrease flows downstream and temporarily degrade downstream water quality by depositing sediment during decreased flows, (3) underground mining and extraction, which would permanently impact aquifers by affecting groundwater flows through these zones, and (4) the discharge of waste waters from oil shale operations, which could temporarily increase water flows into receiving streams, thereby altering water quality and water temperature. - Air. Construction and mining activities during the development of oil shale resources can temporarily degrade air quality in local areas. There can also be long-term regional increases in air pollutants from oil shale processing and the generation of additional electricity to power oil shale development operations. Pollutants,such as dust, nitrogen oxides, and sulfur dioxide, can contribute to the formation of regional haze that can affect adjacent wilderness areas, national parks, and national monuments, which can have very strict air quality standards. Environmental impacts could also be compounded by the impacts of coal mining, construction, and extensive oil and gas development in the area, and air quality appears to be particularly susceptible to the cumulative effect of these development impacts. According to some environmental experts that we spoke to for our 2010 report, air quality impacts may be the limiting factor for the development of a large oil shale industry in the future. - Wildlife. Oil shale operations are likely to clear large surface areas of topsoil and vegetation, and as a result, some wildlife habitat will be lost. Important species likely to be negatively impacted from loss of wildlife habitat include mule deer, elk, sage grouse, and raptors. Noise from oil shale operations, access roads, transmission lines, and pipelines can further disturb wildlife and fragment their habitat. Wildlife is also particularly susceptible to the cumulative effects of nearby industry development. In addition, the withdrawal of large quantities of surface water for oil shale operations could negatively impact aquatic life downstream of the oil shale development. * Socioeconomic impacts. Large-scale oil shale development offers certain socioeconomic benefits outlined earlier, but it also poses some socioeconomic challenges. Oil shale development can bring a sizable influx of workers, who along with their families, put additional stress on local infrastructure such as roads, housing, municipal water systems, and schools. As noted in our 2010 report, development from expansion of extractive industries, such as oil shale or oil and gas, has typically followed a "boom and bust" cycle, making planning for growth difficult for local governments. Furthermore, development of a future oil shale industry would have the potential to replace traditional rural uses by the industrial development of the landscape, and tourism that relies on natural resources, such as hunting, fishing, and wildlife viewing, could be negatively impacted. Our 2010 report noted that current federal research efforts on the impacts of oil shale development do not provide sufficient data for future monitoring and that there is a greater need for collaboration among key stakeholders to address water resources and research issues related to oil shale development. As noted earlier, the federal government is in a unique position to influence the development of oil shale because 72 percent of the oil shale within the Green River Formation lies beneath federal lands managed by BLM. In addition to its leasing of these lands, Interior has sponsored oil shale projects related to water resources--to develop a common repository of water data collected from the Piceance Basin and to begin monitoring groundwater quality and quantity within this basin using existing and future wells. The common repository project was funded jointly with Colorado cities and counties as well as with oil shale companies. DOE also plays an important role in developing these resources and has sponsored most of the oil shale research that involves water-related issues. DOE also provides technological and financial support for oil shale development, through its research and development efforts. However, our October 2010 report noted that Interior and DOE officials generally have not shared information on oil shale research and that there is a need for federal agencies to improve their efforts to collaborate and develop more comprehensive baseline information on the current condition of groundwater and surface water in these areas. Such information will be important for understanding the potential impacts of oil shale development on water resources in the region. * coordinate with DOE and state agencies with regulatory authority over water resources in implementing these recommendations, and to provide a mechanism for water-related research collaboration and sharing of results. Interior fully supported the concepts in the report and agreed with the need to answer the science questions associated with commercial oil shale production prior to its development. In addition, Interior indicated that it already had begun to take some actions in response to our recommendations. For example, Interior told us that USGS is undertaking an analysis of baseline water resources conditions to improve the understanding of groundwater and surface water systems that could be affected by commercial-scale oil shale development. In addition, Interior stated that BLM and USGS are working to improve coordination with DOE and state agencies with regulatory authority over water resources and noted current ongoing efforts with state authorities. In conclusion, Mr. Chairman, while there are potential opportunities for commercial development of large unconventional oil and gas resources, such as oil shale, in the United States, these opportunities must be balanced with other potential technological, environmental and socioeconomic challenges. The recommendations in our October 2010 report on oil shale provide what we believe to be important next steps for federal agencies involved in the development of oil shale, particularly as it relates to water resources. By proactively improving collaboration between departments and state agencies and developing key baseline information the federal government can position itself to better monitor water resources and other environmental impacts should a viable oil shale industry develop in the future. Chairman Harris, Ranking Member Miller, and Members of the Subcommittee, this completes my prepared statement. I would be pleased to respond to any questions that you may have at this time. Contact points for our Offices of Congressional Relations and Public Affairs may be found on the last page of this testimony. For further information about this testimony, please contact Anu K. Mittal, Director, Natural Resources and Environment team, (202) 512-3841 or [email protected]. In addition to the individual named above, key contributors to this testimony were Dan Haas (Assistant Director), Alison O'Neill, Barbara Timmerman, and Lisa Vojta. [hyperlink, http://www.gao.gov/products/GAO-11-929T], August 24, 2011. [hyperlink, http://www.gao.gov/products/GAO-11-319], March 25, 2011. [hyperlink, http://www.gao.gov/products/GAO-11-487T], March 17, 2011. [hyperlink, http://www.gao.gov/products/GAO-10-852T], June 17, 2010). [hyperlink, http://www.gao.gov/products/GAO-09-1014T], September 16, 2009. Reassessment [hyperlink, http://www.gao.gov/products/GAO-09-556T], April 2, 2009. [hyperlink, http://www.gao.gov/products/GAO-09-214R], December 2, 2008. [hyperlink, http://www.gao.gov/products/GAO-08-556T], March 5, 2008. [hyperlink, http://www.gao.gov/products/GAO-08-190R], November 6, 2007. [hyperlink, http://www.gao.gov/products/GAO-07-106], December 20, 2006. [hyperlink, http://www.gao.gov/products/GAO-11-225], March 23, 2011. Development [hyperlink, http://www.gao.gov/products/GAO-11-35], October 29, 2010. [hyperlink, http://www.gao.gov/products/GAO-10-116], November 30, 2009. GAO currently has work ongoing on several topics related to other unconventional energy resources, namely shale oil and gas and issues related to federal and state agency regulation of unconventional resources. (Washington, D.C.: Oct. 29, 2010). Also see related GAO products at the end of this statement. The lowest estimate ever made was 10 billion barrels and the next lowest 32 billion. The current controversy involves a paper by the late Dr. Leigh Price formerly of the United States Geological Survey in Denver, Colorado. A research paper by USGS geochemist Leigh Price in 1999 estimated the total amount of oil contained in the Bakken shale ranged from 271 billion to 503 billion barrels (8.00Ã—1010 m3), with a mean of 413 billion barrels (6.57Ã—1010 m3). While others before him had begun to realize that the oil generated by the Bakken shales had remained within the Bakken, it was Price, who had spent much of his career studying the Bakken, who particularly stressed this point. If he was right, the large amounts of oil remaining in this formation would make it a prime oil exploration target. However, Price died in 2000 before his research could be peer-reviewed and published. We sure do havve reserves, this is but one of them, there are according to past statistics many more right her in our clountry. Sorry I don't have the time to search the, but I do remember the scale of deposits. Its phenominal. I just got back from North Dakota to set up another business. The story below broke while I was there. A lot of jobs there but no housing. BISMARCK, N.D. â€” North Dakota has passed Alaska to become the second-leading oil-producing state in the nation, trailing only Texas, state officials said Tuesday. The stateâ€™s oil patch is drilling at record levels and shows little sign of slowing down. The 152.9 million barrels of crude oil produced in 2011 set a record, surpassing the previous yearâ€™s mark by nearly 40 million barrels, according to the state Industrial Commission. The number of wells in the state jumped from 6,726 in February to a record 6,921 in March, Hicks said. Peak oil is a lie. Man-made global warming is a lie. Overpopulation is a lie. The federal income tax is a lie. The "Federal" Reserve is a lie. Fractional reserve "lending" (which long predates the Fed) is a lie. Corporate "personhood" is a lie. Public "education" is a lie. The official story about the JFK assassination is a lie. The official story on 9/11 is a lie. The War on Freedom "Terror" is a lie. The drug war is a lie. Health care is a lie. Practically everything about Obama is a lie. Our so-called "election" system is a lie. The so-called "free press" is a lie. The Democrat-vs.-Republican paradigm is a lie. The debt money-vs.-gold money paradigm is a lie. The Keynes-vs.-Mises paradigm is a lie. The Austrian School "capitalism"-vs.-Marxist "socialism" paradigm is a lie. North Dakota oil drillers pumped 17.8 million barrels in Marchâ€¦ times 12 months is something like 213.6 million per yearâ€¦ The US consumes more like 10 BILLION barrels per year.. So this represents 2% of US annual use? Shale oil, is NOTHING like drilling a hole and having crude come gushing up, or being able to pump it upâ€¦ it take a lot of oil (energy) to get shale oil out of the ground. Pilate, 2000 years ago, asked Jesus, "What is truth?". I have contended for many years that if Jesus and Pilate would have had the same conversation today, Pilate would ask "Where is truth?". The human race has slipped way too far. Pilate said to Him, â€œWhat is truth?â€� And when he had said this, he went out again to the Jews, and said to them, â€œI find no fault in Him at all. Notice that most of this land in controlled by the government and the oil companies control the government, This oil will be developed, if ever, on the oil companies terms. This is the same as the Alaska North slope oil and gas. By controlling energy they control the economy by the throat. They control the horizontal and vertical , the tail wags the dog. Larson, You hit on something most folks seem to avoid. Pilate wasn't keen of killing Christ, then who was? The Judeans on high, Pharisees, Sadducee's, and the Sanhedrin. The Power's. The truth is and allways has been the No.1 enemy of those on high. The label given to honorable men who come forward is whistleblowers, I'm not fond of that word, it creates a mental image that diminishes the courage and reasoning that motivates the person. Its like saying, Christ was a whistle blower. I went off the map again. Notice that most of this land in controlled by the goverment and the oil companies control the government, This oil will be developed, if ever, on the oil companies terms. This is the same as the Alaska North slope oil and gas. Agreed. I know some people up near Wiliston. They own a lot of farmland BUT NOT THE MINERAL RIGHTS. The Pinchot family originally worked with Teddy Roosevelt to form the Forest Service to create King's err.. "federal" lands and restrict the use of the remaining portions of the U.S. . The Pinchot family owned most the Timber and Coal land around ( Peabody Coal today) and wanted to protect their monopoly of timber and suppling paper for nearly all the newspapers. On the west coast was Zellerbach paper (now IP International Paper which supplied the paper for all the magazines and newspapers on the west coast. Has this American Oligarchy yet to be broken? I don't think so. Not exactly your freedom fighters. 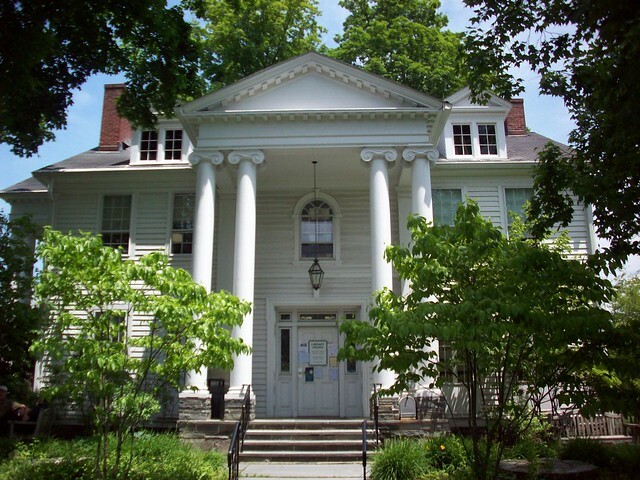 The Pinchot family supported Yale University Graduate Forestry School, which conducted classes at Forest Hall in Milford, just three blocks from The Columns. To this day, Grey Towers is the home of the Pinchot Institute For Conservation, an organization committed to leadership in conservation thought, policy, and action. GreyTowers is a French Chateau in Milford that was Gifford Pinchotâ€™s home until his death in 1946. Cyril Pinchotâ€™s son, James, a wall paper manufacturer, built Grey Towers in 1886, when his own son Gifford was 21 years old. 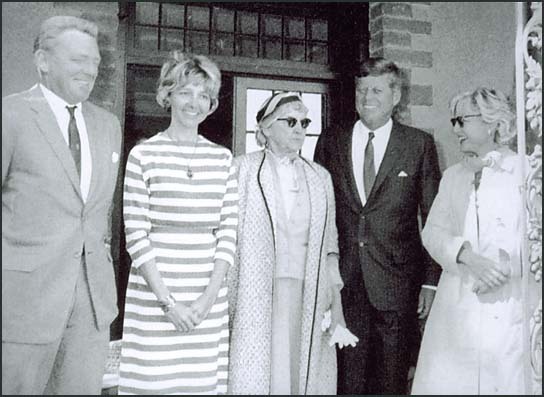 JFK with Mary Meyer nee Pinchot (far right). Antoinette Bradlee is second on the left. In 1944 Mary met Cord Meyer (S&B), a lieutenant in the US Marines who was recovering from serious shrapnel injuries that had resulted in him losing an eye. The couple married on 19th April, 1945. Soon afterwards the couple went to San Francisco to attend the conference that established the United Nations. Cord went as an aide to Harold Stassen [ Stassen was later best known for being a perennial candidate for the Republican Party nomination for President of the United States, seeking it 12 times between 1944 and 2000 (1944, 1948, 1952, 1964, 1968, 1976, 1980, 1984, 1988, 1992, 1996, and 2000), but never winning it or, after 1952, even coming close ] , whereas Mary, who was working for the North American Newspaper Alliance at the time, was one of the reporters sent to cover this important event. Allen W. Dulles made contact with Cord Meyer in 1951. He accepted the invitation to join the CIA. Cord Meyer became part of what became known as Operation Mockingbird, a CIA program to influence the mass media. According to Deborah Davis (Katharine the Great: Katharine Graham and the Washington Post): Meyer was Mockingbird's "principal operative". Mary and the family now moved to Washington where they became members of the Georgetown Crowd . This group included Frank Wisner, Richard Bissell, Desmond FitzGerald, Joseph Alsop, Tracy Barnes, Philip Graham, Katharine Graham, David Bruce, Clark Clifford, Walt Rostow, Eugene Rostow, Chip Bohlen and Paul Nitze. The Meyers also socialized with other CIA officers or CIA assets James Angleton (Cicely Angleton), Wistar Janney (Mary Wisnar), Ben Bradlee (Antoinette Bradlee) and James Truitt (Anne Truitt). On 12th October, 1964, Mary Pinchot Meyer was shot dead as she walked along the Chesapeake and Ohio towpath in Georgetown. Henry Wiggins, a car mechanic, was working on a vehicle on Canal Road, when he heard a woman shout out: "Someone help me, someone help me". He then heard two gunshots. Wiggins ran to the edge of the wall overlooking the tow path. He later told police he saw "a black man in a light jacket, dark slacks, and a dark cap standing over the body of a white woman." Yes to get the 10 Billion bll's a year from these shale/oil deposits will take alot of water and energy. We need a water pipeline from the Artic Canada and we need to develop the north slope of Alaska. But we are not a free country anymore, so this won't happen. The Green River Formation, a largely vacant area where Colorado, Utah, and Wyoming come together, contains about as much recoverable oil as all the rest the world's proven reserves combined, the Government Accountability Office reports. Most of the oil is beneath federal land overseen by the Department of the Interior's Bureau of Land Management, but the government has "locked up" development of the huge resource, critics charge. Anu K. Mittal, the GAO's director of natural resources and environment, said in written testimony submitted to the House Subcommittee on Energy and Environment: "The Green River Formation â€” an assemblage of over 1,000 feet of sedimentary rocks that lie beneath parts of Colorado, Utah, and Wyoming â€” contains the world's largest deposits of oil shale. "USGS [U.S. Geological Survey] estimates that the Green River Formation contains about 3 trillion barrels of oil, and about half of this may be recoverable, depending on available technology and economic conditions. "The Rand Corporation, a nonprofit research organization, estimates that 30 to 60 percent of the oil shale in the Green River Formation can be recovered. At the midpoint of this estimate, almost half of the 3 trillion barrels of oil would be recoverable. This is an amount about equal to the entire world's proven oil reserves." For purposes of comparison, the entire Middle East is estimated to have less than 700 billion barrels of proven reserves. Mittal also stated: "Being able to tap this vast amount of oil locked within this formation will go a long way to help to meet our future demands for oil. "As you can imagine, having the technology to develop this vast energy resource will lead to a number of important socioeconomic benefits including the creation of jobs, increases in wealth, and increases in tax and royalty payments for federal and state governments." She added that the federal government therefore is in "a unique position to influence the development of oil shale," according to GAO testimony. But in testimony that the Obama administration could seize upon to rebuff calls for development of the oil shale, which environmentalists generally oppose, Mittal also noted: "While large-scale oil-shale development offers socioeconomic opportunities, it also poses certain socioeconomic challenges that also should not be overlooked. "Oil shale development like other extractive industries can bring a sizable influx of workers who along with their families put additional stresses on local infrastructure. "Developing oil shale and providing power for oil shale operations and other activities will require large amounts of water and could have significant impacts on the quality and quantity of surface and groundwater resources. "Oil shale operations will also require the clearing of large surface areas of topsoil and vegetation which can affect wildlife habitat, and the withdrawal of large quantities of surface water which could also negatively impact aquatic life." However, Investor's Business Daily observes that the GAO testimony is "exploding the Big Lie pushed by President Obama that we can't drill our way out of high gas prices because we have but 2 percent of the world's proven oil reserves. "Just one small part of the U.S. is capable of outproducing the rest of the planet. "Given that current U.S. daily oil consumption is running at 19.5 million barrels, the staggering amount of Green River reserves would by itself supply domestic oil consumption for more than 200 years. "So why are we keeping it locked up on federal lands?" Come on guys, thre are oil resereves other than shale, I'm not dismissing this, jsut making a statement, We have oil reserves up the Yang. The deal is is not publicized, I beleive it was L.Logan who brought this to our attention, no matter, please check it out, I sincerly believe your wil dig up some imortant info. I apoligize for not having time right now, but checkl it out. The It has been claimed, that just as in the 1970s, when the North Sea oil was about to come on-line, that it would be necessary to create a crisis in the Middle East, in order to boost the price of oil, to a level that would make the North Sea wells worth while, we are now witnessing a repeat of the same process, with one big difference, this time the intention is to destroy the Islamic States. Gnerally I like to back up claims, sorry but I'll have to leave the search up to you, having a tad of trouble in my area and real shiity interentt connections. The point is that Americans are "Can DO" people , we recognize the problems and go to work solving them. We are not Defeatists, we don't ever give up. Yet there is article after article say we are slaves now and we should just give up. Busting the myths about cheap and unlimited oil being broadcast by Rush Limbaugh, Jerome Corsi and other dinosaurs. Here is a article from this year - Notice comments of the "kids" in the audience - they are convinced oil is at an end in 30 years!!! ... But even the trans. Sec will not tell the audience that the US has over one hundred years of oil, and implies the we are "dependent" on Mullas dictators and communists controlled by the oligarchs . In remarks that raised some eyebrows in the audience, the nationâ€™s top transportation official said this week that there is an â€œunlimited supply of oilâ€� in parts of the world. LaHoodâ€™s comments appear to contradict statements by President Barack Obama about the worldâ€™s oil supply. Obama has repeatedly called oil a â€œfinite resourceâ€� in urging America to shift from fossil fuels to alternative energy sources. A rush of recent reports indicates that the explosion of non-conventional fossil fuel production continues to transform the world. (Non-conventional fossil fuel production is the production of oil and natural gas by hydraulic fracking and horizontal drilling.) In fact, 2011 will mark a major turning point in energy production worldwide -- one with profound geopolitical consequences. The first report is that Anadarko Petroleum has just raised its estimate for its Colorado Wattenberg field holdings. Anadarko estimates that the field will yield more than one billion barrels of oil and national gas. This would place it right up there with the now-legendary Bakken shale field (in North Dakota) and the Eagle Ford formation (in Texas). Anadarko is now looking at expanding its operations into Wyoming. The second story is that North Dakota hit a record high oil production in October of 488,000 barrels per day (bpd). This was up 100,000 bpd (or 25%) from June's production. Lynn Helms, director of the North Dakota Department of Mineral Resources, projects that the state's total oil production will exceed 500,000 bpd next year and 900,000 bpd the year after that. The state will soon surpass California (539,000 bpd) and Alaska (550,000 bpd), rivaling top-producing Texas (1.2 million bpd). Another story reinforces these bracing estimates. The National Petroleum Council estimates that by 2035 -- if the regulators will just stop endlessly excreting new hurdles -- the U.S. will hit 3 million bpd of shale oil alone. There are about 14 to 16 new American shale oil fields just starting to be exploited. This has led the federal Energy Information Administration to raise its estimates for total American liquid fuel output by nearly 40% -- for next year alone! The prior report indicates that total (i.e., conventional and non-conventional) American crude oil production hit 5.8 million bpd in September of this year -- an increase of 300,000 bpd (or about 5.5%) from the year earlier. American crude oil production could hit 7 to 7.5 million bpd by 2013, and hit 8-10 million bpd by 2015. Add in natural gas liquids, and we may well hit 11-14 million bpd. That would place our crude oil production up there with Saudi Arabia and Russia and, when you add in our natural gas liquids and ethanol, would place us tops in the world by far in liquid fuel production. In fact, it now appears that in 2011, America will become a net petroleum product exporter for the first time in 62 years. Not only is America now a net petroleum product exporter, but as expert Dave Ernsberger (global director at energy consulting firm Platts) put it, "t looks like a trend that could stay in place for the rest of the decade. The conventional wisdom is that [the] U.S. is this giant black hole sucking in energy from around the world. This changes the dynamic." The immense non-conventional oil resources literally below our feet have made Big Oil fundamentally reassess its geo-economic worldview. Where in the past, the major private oil companies went to faraway (and often dangerous) regions like the North African desert, the Caspian Sea, and the Niger Delta, oil companies are now focusing on developed nations -- for a variety of reasons. First, producing the energy supplies where they are most needed -- namely, in the industrialized economies that utilize those supplies to produce most of what the world consumes -- keeps transportation costs down. Second, keeping vast sums of money from flowing to authoritarian or hostile regimes lessens the risk that they will attack the industrialized democracies. This in turn lessens the chance of major recessions, during which the demand for oil plummets. Third, the more predictable legal and political systems found in industrialized economies make rational planning far easier for the oil companies. In particular, they don't have to face having their assets "nationalized" (i.e., stolen). Big Oil obviously has concluded that it is better to earn lower but more reliable profits in industrialized democracies than to seek out higher but easier-to-seize profits in corrupt authoritarian regimes. Fourth, big private oil companies are not permitted to compete with the state-run or crony capitalist companies that take their place after their assets get stolen. This has happened over and over again, from Mexico to Saudi Arabia to Russia to Venezuela. The elites in these statist authoritarian regimes hog all the profits for themselves and freeze out the very private companies who developed those resources to begin with. In short, the oil companies are returning, drill bit in hand, to the countries that still allow private enterprise in energy production. So Big Oil is shifting to the OECD countries. The energy consulting firm Wood Mackenzie estimates that North America, Europe, and Australia together hold the promise of delivering $1.7 trillion (or more than half the total) of the future value of Big Oil. For instance, over the last seven years, Shell has gone from having about 50% of its operations in OPEC countries to 70%, mostly in Australia, Canada, and the U.S. And Exxon-Mobil is bulking up on North American resources. It acquired XTO Energy last year, a major shale-gas company, and its non-conventional production will likely double in the next ten years. This lesson -- that non-conventional sources of fossil fuels can liberate your country from suppliers that are hostile to it -- is not lost on other countries. For example, the Chinese, who have perfected the art of flattery by imitation, are turning to non-conventional fuels with a passion. PetroChina has discovered shale gas in China's Sichuan province. It has drilled over 20 wells, all successful. China doesn't at present have commercial shale gas production, but this discovery tells them it should. And the potential for Chinese non-conventional gas production is simply staggering. The U.S. Energy Information Administration (EIA) currently estimates that the Chinese have over 1,275 trillion cubic feet of recoverable shale natural gas, the largest known reserves of any country on Earth. The Chinese are thus sitting on three centuries' supply of the stuff (at current usage)! Mr. Fu Chengyo, chairman of the massive Chinese fossil fuel conglomerate Sinopec, projects that China's natural gas production will eventually surpass even our own. Globally, the potential for vast shale gas production (not counting shale oil, tar sands oil, and deep sea conventional oil production), is beyond staggering -- it is stupefying. The current federal EIA's yearly estimate puts the total recoverable non-conventional natural gas in 32 countries -- mainly developed ones -- at no less than 5,760 trillion cubic feet. Add in America's estimated 862 trillion cubic feet, and you're looking at 6,622 trillion cubic feet. That's beyond staggering, beyond stupefying -- it's...what? Surreal? That huge amount of non-conventional natural gas is, please note, in addition to the proven conventional reserves of 6,609 trillion cubic feet. Now add in not just proven (easily recoverable) conventional natural gas reserves, but all technically recoverable conventional gas (about 16,000 trillion cubic feet), and you have on the order of 22,600 trillion cubic feet of natural gas available to the world -- with just the currently known technology. For decades, the environmentalist fanatics have repeated the Malthusian myth that we are running out of fossil fuels. But the whole Thanatos-worshiping pagan enviro-religion is now facing its Copernican challenge. Philosopher Gary Jason is a senior editor for Liberty, and author of the new book Dangerous Thoughts (available from GaryJasonBooks.com and Amazon). Energy, who controlls it holds the world in their hands. People mention solar and wind power as alternatives, thats cute for folks with big bucks, not the peons of this world $$$$$$$$. My bottom line has been & allways will be, there are cheap, clean, effective forms of energy. Problem, the the supercorps buy them out and get the patents, or they wack out the inventors. Does anyone truly beleive they would relinqush their domain? The games they play astonish me, battery cars, solar panels, its absurdity. Not science fiction folks,the reality. I have seen two examples, one was a patented carberator capable of over 70 MPG back in the 50's, the other was a inventor in N.H. during the oil crisis in the 70's GIVING a patent for a friction heater at costs 20% the price of Home heating oil pricing & along with a prototype to the people, he and his wife and son were vaporized. Telsa patents were classified. Oil is King, and any competition is bought off or eliminated, the basics of life, energy, agriculture , water, medical, pharmecutical, etc. who controls them? 3 guesses. Is all this about where is the oil, how much do we have in reserves or who controlls the cycle. The U.S. exported more gasoline, diesel and other fuels than it imported in 2011 for the first time since 1949, the Energy Department said. Shipments abroad of petroleum products exceeded imports by 439,000 barrels a day, the department said today in the Petroleum Supply Monthly report. In 2010, daily net imports averaged 269,000 barrels. U.S. refiners exported record amounts of gasoline, heating oil and diesel to meet higher global fuel demand while U.S. fuel consumption sank. Refiners are expanding on the Gulf Coast and in the Midwest, even as unprofitable plants along the East Coast were shut. Operable capacity in the U.S. climbed 0.8 percent to 17.7 million barrels a day in December from a year earlier. Total U.S. oil product demand fell 9.5 percent to 18.8 million barrels a day last year from 20.8 million in 2005, department data show. â€œThe reason we can export so much is demand in the U.S. is weak,â€� Cohan said. Since 2005, the U.S. has lost nearly 2 million barrels a day of total product consumption, he said. Remember this story about the Chevy Volt? Now the Volt factory is going to CHINA. Electric cars, who controlls the juice, line up at the GM electric filling station, same Shiite different name. 250,000 bucks of our tax money. They would controll human excrement if there was money in it. A steeper-than-expected rise in US shale oil reserves is about to change the global balance of power between new and existing producers, a report says. Over the next five years, the US will account for a third of new oil supplies, according to the International Energy Agency (IEA). The IEA said it expected the US to overtake Russia as the world's biggest gas producer by 2015 and to become "all but self-sufficient" in its energy needs by about 2035. The rise in US production means the world's reliance on oil from traditional oil producing countries in the Middle East, which make up Opec (the Organization of the Petroleum Exporting Countries), would end soon, according to the report. US production is set to grow by 3.9 million barrels of oil per day (bpd) from 2012 to 2018, accounting for some two-thirds of the predicted growth in traditional non-Opec production, according to the IEA. Porter Stansberry claims that there is going to be 20 areas like Williston ND in Canada and the USA in the next 20 to 50 years. Gordon Duff on the Jeff Rense Show claimed that Venezuela is sitting on 5 trillion barrels of oil. This may have something to do with Chavez's early departure from this world. Duff also reported that the Russians are not making their own gasoline. Why should they? The USA is selling it to them for 45 cents a gallon delivered. So every time you fill your tank, you are helping the Russians get a discount. We pay more so they pay less. There should be hearings on this. THANK YOU OBAMA. Prince Alwaleed bin Talal, the billionaire Saudi Arabian investor, has warned that his countryâ€™s oil-dependent economy is increasingly vulnerable to competition from the US shale revolution, setting him at odds with his countryâ€™s oil ministry and Opec officials. In an open letter addressed to Ali Naimi, the Saudi oil minister, the prince called on the government to accelerate plans to diversify the economy. â€œThe world is increasingly less dependent on oil from Opec countries including the kingdom,â€� Prince Alwaleed wrote. Speaking in Washington in April, Mr Naimi, who has been the countryâ€™s oil minister for almost 20 years, welcomed increased American output as a stabilising influence on global oil prices. He also pointed out that Saudi crude exports to the US actually increased in 2012. That is largely because US refiners have not been able to replace the kingdomâ€™s heavy and sour crude oil. But Prince Alwaleed rejected Mr Naimiâ€™s assessment, although he focused on rising US gas output rather than the countryâ€™s crude oil production, which saw its single largest annual increase ever last year. 3.0 trillion estimated in ground. 1.5 trillion we might get out using known technology. - In early wells, such as Oil City, PA, once you drilled a hole (low energy to just drill a shallow hole) and oil gushed out. - Typically for years, drill a hole, and pump out the oil as it seeped underground to your well. Energy (oil) drilling and pumping. - If you have to drill, blast, or send down hot water, or chemicals to thin the oil, which logically will only flow some limited distance, how many holes do you have to drill, and how much energy (oil) for all of these holes and underground "cooking"? Even Nikoli Telsa developed a alterante form of energy( independense) decades past , not oil. He was run over by a car and died pennyless, his patents were confiscated by gov agents and are sealed, burried.. Does big oil want comeption, it doesn't appear they will give up the crown, the monoply, the power & control. For what it's worth, I went to college with a guy from Texas, whose Grandfather had been in the oil business. He said that his Grandfather told him that the US had VAST oil reserves, and we were just waiting for the right time to start using them. Whatever one hears about oil somewhere/somehow within the US, it is NOT just a matter of how much is there, nor how much can be gotten out, but also what amount of of energy in terms of oil does it take to get it out & processed, then compare what we get in net against something like 10 billion barrels per year consumed in the US. Japanâ€”where natural gas costs are currently $16 per million British thermal units, four times the level in the U.S.â€”has vowed to bring methane hydrate into the mainstream by 2023 after a successful drilling test in March. In the U.S., scientists explored the northern Gulf of Mexico in May to map some of the 6.7 quadrillion cubic feet of methane-hydrate clusters believed to be underwater there. The Consortium for Ocean Leadership, a nonprofit group of researchers, is now trying to convince the Department of Energy to lend it a research drilling ship to do more tests. "There are a huge amount of people internationally working in this area," said Carolyn Ruppel, head of the gas hydrates project at the USGS. "A lot of national governments have gotten into the game." As fracking catapults the United States to the top of the list of the worldâ€™s largest crude oil and natural gas producers, climate scientists worry that the nation's booming fossil fuels production is growing too quickly with too little concern about its impact on climate change, possibly endangering Americaâ€™s efforts to curb global greenhouse gas emissions. The U.S. is likely to become the worldâ€™s top producer of crude oil and natural gas by the end of 2013, producing more hydrocarbons than either Russia or Saudi Arabia, the Energy Information Administration recently announced. the EIA reported this week that natural gas production has increased 30 percent â€” an increase of 3.2 billion cubic feet per day â€” so far this this year over 2012. The U.S. Department of the Interior announced Thursday the Permian Basin?s Wolfcamp shale and Bone Spring formation spanning parts of West Texas and eastern New Mexico hold the largest potential oil and gas resources ever discovered. Federal surveyors note the Bone Spring plays could offer roughly seven times the amount of oil as the Bakken shale in North Dakota. In a new assessment, the U.S. Geological Survey (USGS) estimated these untapped regions in the Delaware Basin of the Permian contained 46.3 billion barrels of oil, 281 trillion cubic feet of natural gas, and 20 billion barrels of natural gas liquids, more than two times larger than its 2016 assessment of the Wolfcamp shale play in the Permian?s Midland Basin. ?Christmas came a few weeks early this year,? said U.S. Secretary of the Interior Ryan Zinke in a prepared statement. ?American strength flows from American energy, and as it turns out, we have a lot of American energy.? Zinke added, ?Before this assessment came down, I was bullish on oil and gas production in the United States. Now, I know for a fact that American energy dominance is within our grasp as a nation. ?